The Formulate® 10ft Horizontal Curve 9 Tension Fabric Display is a sophisticated, horizontally curve shaped exhibit booth that combines state-of-the-art zipper pillowcase printed fabric graphics with an advanced lightweight aluminum tube structure to provide unique design, functionality, and style. This display features a robust accent ladder that features two rigid graphics, top and bottom, as well as three shelves to support products for display. Stretch fabric graphics are hand-sewn, durable and dry-cleanable. Got a lot of stuff? You came to the right design. 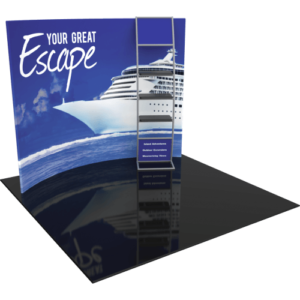 Use this 10×10 trade show display for the best part of your company, your products! Let your materials do the talking with a hanging displays and shelves with back-up graphics and brand imagery. This booth invites people in by getting the pedestal out of the way for easy access. 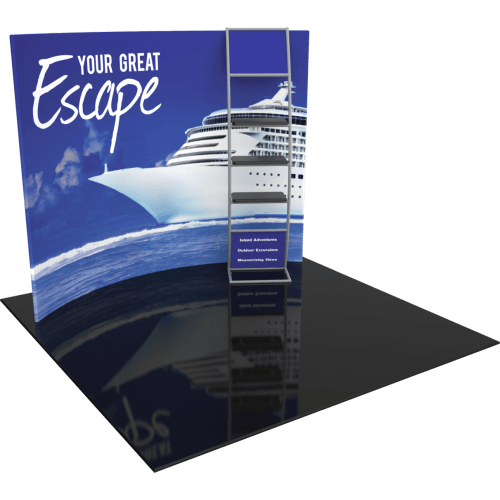 The Movil USA 10×10 trade show exhibit design is highly flexible on design and gives the exhibitor multiple design opportunities to make a statement. This space is highly popular and gives traffic a conversation starting space for any company looking to get attention. Sleek, simple, and modern- a great trade show booth design idea for all.